Batter Mix For Meat POH! 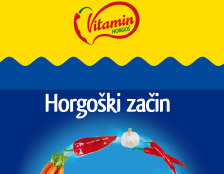 Famous Horgos paprika is unique in quality and fineness of milling, chemical and bacteriological purity. "Horgos spice" is a mix of spices you can always rely on. By quality it is among the best in its category. "Mint tea has a specific, very aromatic and refreshing taste and smell. ALAS is the ideal blend of selected spices and vegetables making the taste of fish soup full and rich. POH! is a mixture for making batter for meat. It is the unique product in the market. It is being produced with 4 different flavors. Meatless soup with vegetables and pasta. 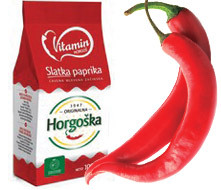 VITAMIN in Horgos is a reputable manufacturer of the famous Horgos paprika. Our production technology is based on more than 230 years old tradition, for which Horgos, a village in the north of Backa, has became synonymous with the finest sorts of pepper and paprika. POH! 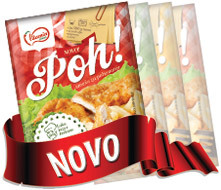 is a mixture for making batter for chicken meat – our new product, unique in the market. Four different flavors are available: garlic, spicy, cheese-flavored and ham-flavored. Coated chicken meat is ready to be baked in an owen. Easy, quick and crunchy! produce seeds to grow peppers for seasoning on 2,000 ha of land.